Back in the late 1970s, Steve Rogerson was a student at Lancaster University and spent much of his spare time working on University Radio Bailrigg, the student radio station. Here he recalls how that work led to him not only meeting Debbie Harry of Blondie fame but having a meal with her and Chris Stein in the university refectory. When I went to university in 1975, I had little idea a decision I made in my first week would lead me to meeting a number of famous people, including having a meal with Debbie Harry of Blondie. The university was Lancaster in the UK, and the decision I made at the freshers’ fair was to join the university radio station – called University Radio Bailrigg in those days, Bailrigg being the name of the site on which the university campus was built. Before I was even let on air though, I had to learn how to work all the equipment. The shows tended to be self operating, so you had to cue up your own records and deal with the mixing desk and other pieces of studio equipment while broadcasting. Given some of this was held together by tape and wasn’t the most reliable, you also had to handle break downs while on air, and trying to keep that secret from the listeners. However, I digress. One of the advantages of being on the station was that you sometimes interviewed the groups that played at the university, and we had quite a few big names during the three years I was there. But a rookie first year was not going to get one those. As such, another first year student and I were dispatched to interview comedian Mike Harding when he did his stand-up show. I was a little bit of a fan of Mike Harding and was a tad nervous, as was my companion. Now, though both of us had learned how to operate the studio equipment, this was the first time either of us had had any experience with the portable tape machine and, as such, Mike Harding watched for a while with amusement while we tried to work out what to do before the interview could start. He was a nice man, though, and actually showed us how to operate it. Thank you, Mike, for that, and the interview went fine. By the time the 1978 Rag Ball came around, I was much more experienced and wasn’t fazed at all when I was given the task of interviewing Blondie. This was a much sought after interview among the station personnel but I was chosen because I’d been a Blondie fan before they were even famous, raving many a time about how good their first album was on air. As such, another DJ – Dave – and myself (we always went in pairs) set off for the venue during their afternoon sound check to see if an interview would be possible after the show. Their manager said no because they had to leave straight away but said that we might be able to do an interview that afternoon. While we were talking with him, the band were having a big row on stage during their sound check, leading to Debbie Harry storming off followed closely by her boyfriend and guitarist Chris Stein. When the manager chose that moment to ask about the interview, my heart sank. But then Debbie came walking up to us and said she would do the interview but needed to eat first. Now, Lancaster was a campus university, a few miles out of town. The choice was a meal in the university refectory or a trip to the city centre. I was more than a little surprised when she opted for the refectory. And so to one of the most unusual meals I have ever had, the four of us (Dave, Chris, Debbie and I) sitting in the university refectory watched enviously by all the other students while we tucked into fairly bland food. I remember Debbie was not impressed by the curry. The interview went well afterwards, but I have to add a mention to a nice touch by Chris. 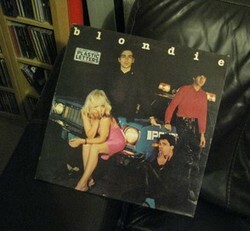 The Blondie album Plastic Letters had just been released and though I’d listened to it a number of times I had no copy of my own. Chris asked me why and I said a student’s budget limits how often records can be bought. He thus took my address and promised an album for both of us, and sure enough a few days later a package with two albums arrived in the post. Thank you, Chris. How exciting that must have been! I'm more of a classic rock fan, pre-Blondie, but I do like to hear Rapture now and then. And Heart of Glass.